This has been in my mind for quite a while, so I thought I’d write it down. I don’t know if it’s possible right to install extra keyboard through the Marketplace at this moment, but this keyboard concept would be great as an app available there, altough maybe we don’t want it as a default keyboard. This is also not an original idea of mine: I used to have this kind of keyboard on my Nokia 5800 (Symbian S60) but I haven’t been able to find one like this for Android so far, so I think it’d be a plus to have it on Firefox OS. It’s not easy to fit a good keyboard on a small smartphone screen, especially in portrait mode, and Firefox OS 1.3 comes with huge improvements on this side. If you’re a non-English speaker, however, writing a sentence can still be a painful experience: if you need to type a number you have to switch keyboard to the numbers and symbols view and then back and if you need some accent on the character you have to keep tapping the key, wait for the popup to come up and choose your accented char from a variety of choices. All this makes you loose quite a bit of time while tiping, but at the same time you can’t add other keys to the keyboard or they’d be too small to tap. Here’s where swipe comes to rescue, to multiply the uses of a single key. The image below shows how keys would show in the multifunction keyboard I have in mind. For sake of time saving, I’ve only modified the Q, W and E keys. With this technique, you can reach easily and in a much faster way numbers and accented chars that are most used in your language. For example, if you’re Spanish you may be interested in having the char ñ on the N key or if you’re French the char ç on the C key. Everyone would be interested in having the comma on the full stop key. 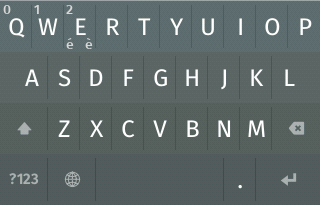 The keyboard I had on my old Nokia also added other symbols to the free keys, but that may be going too far, making the keyboard hard to read. Unfortunately I really can’t code the mockup I’ve just shown you, but if you can and if you’re interested in this idea we can work together to make it happen. If you can’t or don’t want to help, I’d still like to read your comment on this. 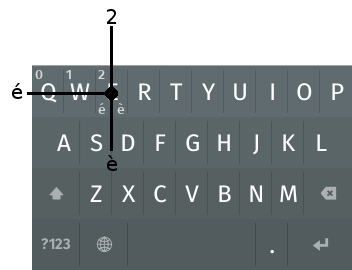 6 commenti per "Ideas for a faster Firefox OS keyboard"
I’m probably not doing it right but when im typing on a virtual keyboard (portrait mode) i tend to never miss the keys on the side of the screen. I miss the ones in the middle. A and L look huge. The rest make sense although i got used to the “traditional stuff”. I would love that. Today I still miss the N800 keyboard, which has similar behavior — It was possible to capitilize letters pressing a key and moving up, use backspace moving left or ‘enter’ moving down. 2 thoughts in passing – 1 would be to look into single handed word entry systems, like the microwriter (CyKey) chord approach, which should be feasible on larger screens ith multitouch. The other is the thumb split keyboard approach, like the kalq keyboard. The latter presumably could be available for implementation as think was EU funded project. In French for [e] it is necessary [é], [è], [ê], [ë]. With , 5 solutions are necessary. In AZERTY keyboard [e] is also € symbol. A circle of choice would perhaps be more appropriate. I’m not saying that all the chars related to a letter should be fast-accessible, only the most used ones. There’s space for ê in the top right corner, while ë and € are not used so frequently in French, too, and may be accessible in the popup that appears when you keep the key pressed. Having a circle of choice means that this circle has to appear somehow, like the popup with the secondary choices. Maybe a circle is faster than a line, but it’s still not as fast as my solution. I believe for every language we can find a maximum of four choices for each key and leave the rest in the popup.